From the outside to the inside, one distinguishes between the dura mater (= outermost layer), the arachnoid mater, and the pia mater. The arachnoid and cranial pia mater together forms the leptomeninges (soft meninx) and originate from one single layer. Opposite them, there is the dura mater (hard meninx), which is also referred to as pachymeninx (pachyderm = thick-skinned). The meninges, in combination with the subarachnoid space filled with cerebrospinal fluid, and the calvaria, protect the brain from concussions and blows, for instance. Blausen.com staff. “Blausen gallery 2014”. Wikiversity Journal of Medicine 1 (2). doi:10.15347/wjm/2014.010. ISSN 20018762 . Superficial layer known as the periosteal (stratum periostale). This layer serves as the inner layer of the skull (endocranium). An inner meningeal layer (stratum meningeale).This is known as the trues dura matter.The dura surface in association with the skull (as opposed to the spinal cord), the periosteal section is tightly grown, together with the periosteum of the calvaria. 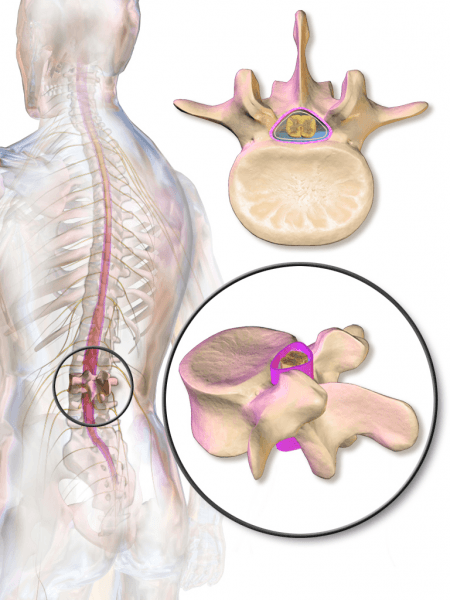 When it covers the spinal cord, it is known as the thecal sac. An exception is the places in which the venae emissariae run through the dura mater (see figure). The above mentioned veins then flow into the venous blood vessels of the brain (dural venous sinuses) which are located between the two layers of the dura mater. Aside from the venae emissariae, the bridging veins which run between the arachnoid mater and the meningeal layer of the dura mater flow into the dural venous sinuses as well. An injury of these bridging veins results in subdural bleeding. Due to the tight connection between the dura mater and the arachnoid mater, a true subdural space usually does not exist. However, subdural bleeding may cause the neurothelium of the arachnoid mater (see below) to detach from the dura mater, creating an artificial subdural space. Please note: An epidural space exists in the vertebral canal, but not in the brain. In some places, the dura mater extends into the depths of the brain and thereby forms septa or duplications of the meningeal layer of the dura, respectively. Overall, four septa of the dura mater are differentiated between. Falx cerebri: It is the largest septum which is sickle-shaped and runs through the fissure longitudinalis cerebri, and separates the two brain hemispheres from one another. The falx cerebri originates in the crista galli of the ethmoid bone. It separates the two cerebral hemispheres. The falx cerebelli/ cerebellar falx. It is a vertical dural fold that lies inferior to the cerebellar tentorium in the posterior cranial fossa separating the cerebellar hemispheres. The tentorium cerebelli (tentorium = time), separates the occipital lobe of the brain from the cerebellum.In addition, with the aid of the tentorium cerebelli, one differentiates between the supratentorial telencephalon and the infratentorial cerebellum. It has an opening, the so-called tentorial incisura, for the brain stem to pass through. 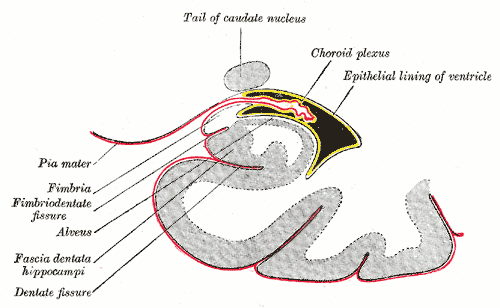 The diaphragma sellae. It covers the sella turcica andhas a small opening for the pituitary stalk and hypophyseal veins to pass through. The blood supply of the dura mater, along with the supply of the periosteum and the neighbouring cranial bones, basically comes from three arteries. The main supply hereby comes from the middle meningeal artery, which is a branch of the maxillary artery. The two other supply arteries, the anterior and posterior meningeal arteries, play rather a minor role from a clinical point of view. In traumatic brain injury cases, the middle meningeal artery may tear, possibly resulting in epidural bleeding, whereby this epidural space normally does not exist due to the tight connection between the dura mater and the periosteum. The innervation of the dura mater occurs via the cranial nerves V (trigeminal nerve), IX (glossopharyngeal nerve) and X (vagus nerve), as well as via the first two branches of the cervical nerves. In cases of meningitis, these sensitive nerves are irritated, resulting in headaches and reflective stiffness of the neck. Furthermore, in order to relax the meninges as much as possible, the head is held in a certain way which is supposed to relax, but rather leads to a hyperextension of the head. In contrast to the dura mater, the brain is not sensibly innervated, and therefore insensitive to pain. Please note: Headaches always emanate from the meninges since the brain itself is not sensibly innervated. As the dura mater is made up of firm collagenous connective tissue, space demanding processes such as bleeding or tumours in the cranial fossa, may lead to incarcerations in the area of the septa. Here, one differentiates between an axial and a lateral incarceration. The axial incarceration represents a symmetrical incarceration due to a process that takes place equally in both hemispheres (i.e. cerebral edema). In case of an upper axial incarceration, the two middle and lower parts of the temporal lobe are pressed through the slit of the tentorium cerebelli and, as a consequence, apply pressure on the midbrain (mesencephalon). In cases of a lower axial incarceration, a displacement of the cerebellar tonsils through the foramen magnum, and thus, a compression of the brainstem take place. On the other hand, there is the lateral incarceration which happens in cases of unilateral, space demanding processes (i.e. brain tumour and bleeding). In this case, a displacement of the crura cerebri to the opposite side takes place due to an ipsilateral herniation of the temporal lobe in the area of the tentorium cerebelli. As a result, the pyramidal tract is damaged before it crosses over to the contralateral side, meaning the muscles of the opposite side are affected. The arachnoid mater represents the middle layer of the meninges, and consists of a fine layer of connective tissue. 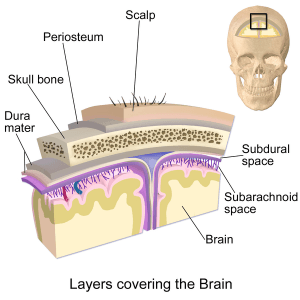 The part of the arachnoid mater that borders the dura mater is made up of multiple layers of flat cells (meningeal cells). 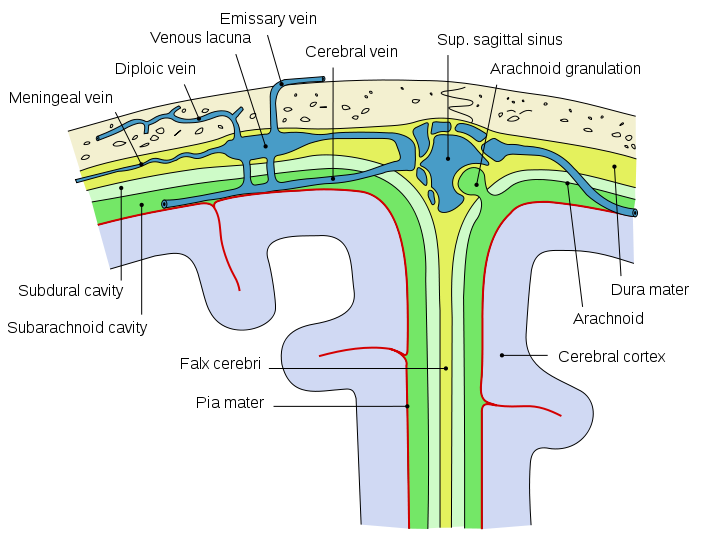 These layers are defined as the neurothelium as the membrane is a derivative of the neural crest mesoectoderm of the embryo. There, the meningeal cells are closely connected with each other via tight junctions, and form a barrier between the dura mater and the subarachnoid space (blood-cerebrospinal fluid barrier). It is closely associated with dura matter superiorly and the inner surface covers the brain (arachnoidea encephali) and spinal cord (arachnoidea spinalis). 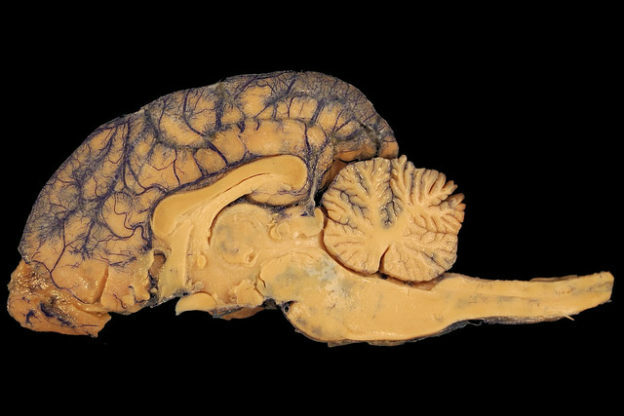 The part covering the brain cavity does not form folds like the dura matter apart from the region of the longitudinal fissure. The part covering the spinal canal continues until the level of S2 where it ends as the filum terminale attached to the coccygeal end of the spinal column. Clinical: Originating from cells of the arachnoid mater, so-called meningioma may occur. Those are slowly growing, usually benign brain tumours, which are among the most frequent tumours in the brain. The border of the subarachnoid space is formed by the outer arachnoid mater and the inner pia mater. Within the subarachnoid space, there are numerous connective tissue trabeculae, which are also covered by meningeal cells. Furthermore, the subarachnoid space contains the cerebrospinal fluid, which is produced in the area of the choroid plexus (roof of the third and fourth ventricle, wall of the lateral ventricles) and therefore forms the outer cerebrospinal fluid space. The cerebrospinal fluid finds its way through three openings in the roof of the fourth ventricle into the subarachnoid space, and from there via the arachnoid villi into the venous vascular system. The arachnoid villi (granulationes arachnoidea Pacchioni) represent bulges of the arachnoid mater, with parts of the subarachnoid space into the lumen of the dural venous sinuses. They serve to reabsorb the cerebrospinal fluid into the blood. As the arachnoid mater has the calvaria as its border, as opposed to the pia mater which rests against the surface of the brain, it leads to expansions of the subarachnoid space where there is a deviation from the scull’s inner surface to the brain’s surface. These expansions are called cisterns (subarachnoid cisterns). In this context, the most important cistern is the cerebellomedullary cistern (cisterna cerebellomedullaris), which is located between the cerebellum and the medulla oblongata. This cistern may be used via a suboccipital puncture to extract cerebrospinal fluid for clinical diagnostics. However, in the daily clinical routine, the lumbar cistern, located in the lower lumbar area, is by far used more often to capture cerebrospinal fluid (lumbar puncture) as there are fewer complications expected than with a suboccipital puncture. Additional cisterns are, among others, the cistern of the lateral cerebral fossa, the ambient cistern, and the interpeduncular cistern. The cranial pia mater rests directly on the gyri of the brain, and continues into the respective sulci. The Virchow-Robin Space, which is located between the cranial pia mater and the membrana limitans externa of the brain, separates the pia mater from the brain. The cranial pia mater consists of a thin layer of connective tissue cells (meningeal cells) which brings about a shimmering appearance of the brain’s surface. The cranial pia mater is very vessel-rich and forms the outermost layer of blood vessels, which enter or exit the central nervous system, respectively, and eventually enter into it along with them. Together with the arachnoid mater, the pia mater forms the border of the subarachnoid space (see above). The arachnoid mater, the cranial pia mater, as well as the subarachnoid space, continue on as arachnoid mater and pia mater spinalis in the vertebral canal. 1. Which statement concerning the meninges is correct? The dura mater and the arachnoid mater form the pachymeninx. The hard meninx is called leptomeninx. The brain and the spinal cord are covered by three meninges. The three meninges are the arachnoid mater, the cranial pia mater and the leptomeninx. The meninges are not sensibly innervated. 2. Which statement concerning the dura mater is not correct? The falx cerebri represents a duplication of the dura mater. The dura mater consists of two layers. The dura mater rests firmly against the periosteum of the calvaria. It consists of firm, collagenous connective tissue. 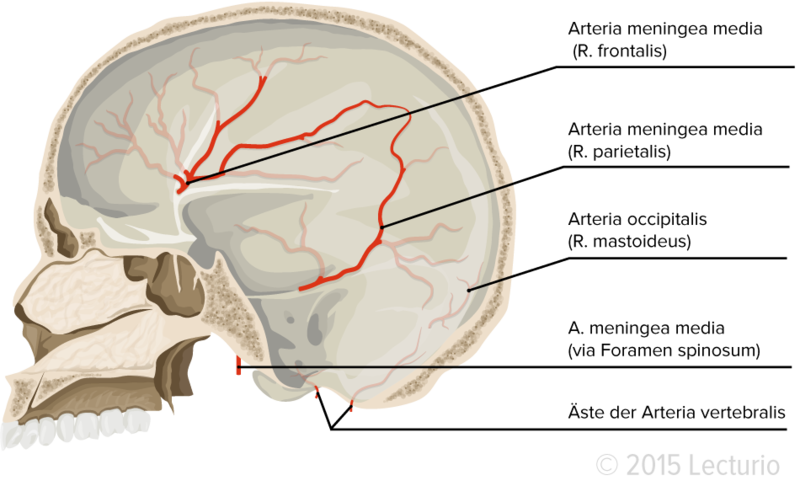 The main blood supply occurs via the posterior meningeal artery. 3. Which statement concerning the arachnoid mater is not correct? The arachnoid mater and the pia mater together are called leptomeninx. The arachnoid mater and the pia mater originate from one layer. 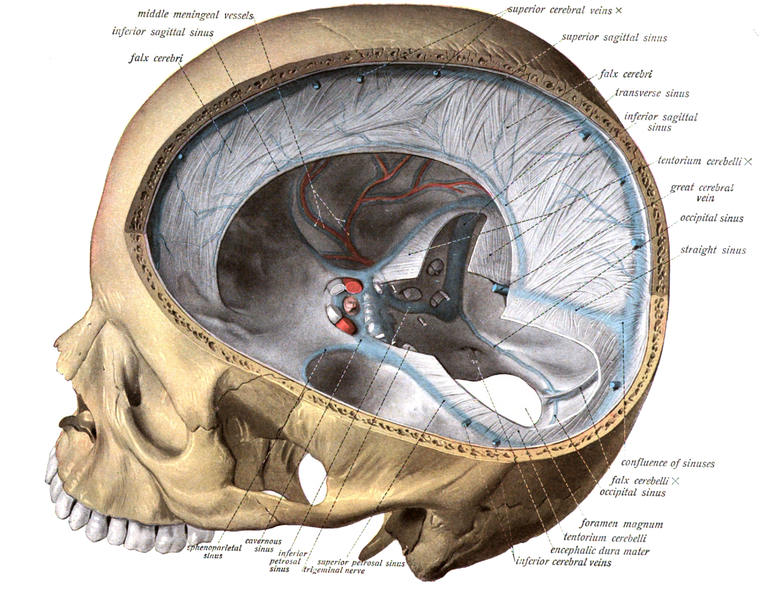 Bulges of the arachnoid mater are defined as choroid plexus. The arachnoid mater forms the middle layer of the meninges. It forms the blood-cerebrospinal fluid barrier. 4. Which statement concerning the cranial pia mater is correct? The cranial pia mater lies directly against the periosteum. The cranial pia mater consists of a thick layer of connective tissue cells. The cranial pia mater forms duplications. The cranial pia mater consists of two layers. It continues into the respective sulci. Burger, P, Scheithauer, B, & Rushing, E. (2012). Meninges. Lippincott Raven. Hughes, D., La Trobe University, & La Trobe University. (2014). The meninges.